Right before the International CES 2015, Storage Visions holds a small conference about the state of storage. 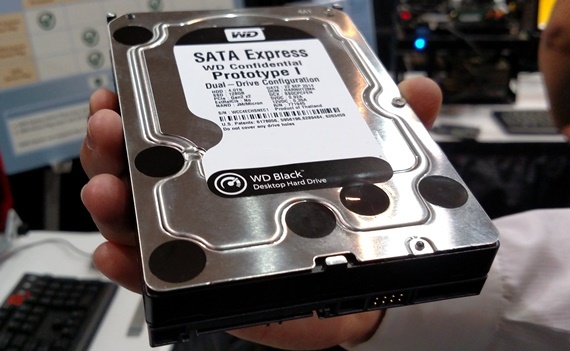 While there, I talked with the folks at Western Digital (WD) to learn about a new prototype dual-drive. This drive is a standard 4 TB hard drive but also has a 128 GB SSD inside. I caught up with Fleming Doreng of Western Digital to find out more about this hard drive. The drive utilizes the PCIe 2.0 x2 interface using a special cable. If you do not have the interface, you will need to get an adapter cable for power, and 2 SATA cables for the drives. The drives can work as one or be separate drives. The SSD is like short-term memory and the HD is long-term. With this system and two SATA Express drives at RAID 0, you can get up to 1000 MBps transfer.